I've finally made some progress in my craft room. At least I can see the floor and the top of my desk! I'm going to tackle my gift wrap this week and see if I can come up with some way to tame the ridiculous amounts of gift bags that I've accumulated, but am unable to part with-- I like the upcycle part of gift bags, but find they're a bit hard to organize without taking up a bunch of space. I didn't end up buying it, but I did purchase this lovely ceramic bird house with the extra 15% President's Day coupon. 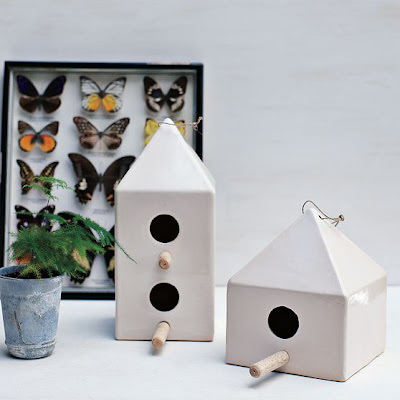 It's time to change-up the mantel and I think birds and birdhouses will be perfect for spring.